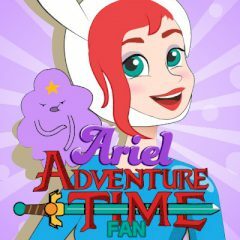 How would Ariel look like, if she was the Adventure Time hero? She is a big fan of the cartoon, so help her to choose an outfit she would love to wear. Have you ever wanted to look like your favorite characters or celebrities? Ariel is a huge fan of Adventure Time and she wants to cosplay many of those heroes. Help her to choose the right outfit for this case.